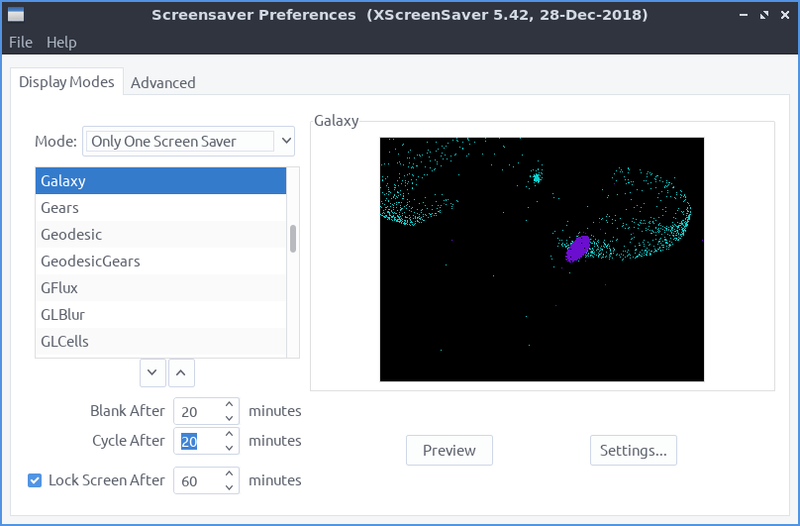 Screensaver is an application to control what screensavers are used on the system. The Mode drop down has 4 settings Disable turns off the screensaver, blank screen only just turns the screen itself off, one screensaver sets one screensaver, and random screensaver selects a random screensaver. To set how long it takes your screen to go to the screensaver change the field that says Blank After to the number of minutes you want the system to be idle before starting the screensaver. If you have a random screensaver set you can change with the number of minutes it says with cycle after for when the screensaver will change to another one. The checkbox for Lock Screen After takes the number of minutes to lock the screen and the number of minutes is how many minutes it takes to lock the screen. If you try to select a screensaver that is not installed it will not show on the right hand side of the window. To preview a screensaver as when it would be activated press the Preview button. If you want to kill the daemon File ‣ Kill Daemon. To restart the screensaver daemon File ‣ Restart Daemon. If you try to open the screensaver settings without having the screensaver daemon running you will bring up a dialog if you want to launch it.